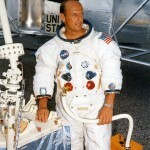 Full Name: Charles “Pete” Conrad, Jr. Attended primary and secondary schools at Haverford School in Haverford, Pennsylvania, and the Darrow School, New Lebanon, New York; received a Bachelor of Science degree in Aeronautical Engineering from Princeton University in 1953; an Honorary Master of Arts degree from Princeton in 1966; an Honorary Doctorate of Laws degree from Lincoln- Weslyan University in 1970, and an Honorary Doctorate of Science degree from Kings College, Wilkes-Barre, Pennsylvania in 1971. Conrad entered the Navy following graduation from Princeton University and became a naval aviator. He attended the Navy Test Pilot School at Patuxent River, Maryland and, upon completing that course of instruction, was assigned as a project test pilot in the armaments test division there. He also served at Patuxent as a flight instructor and performance engineer at the Test Pilot School. He has logged more than 6,500 hours flying time, with more than 5,000 hours in jet aircraft. 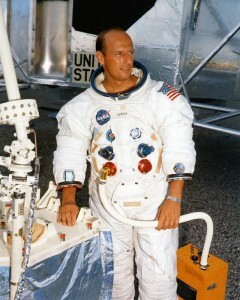 Conrad was selected as an astronaut by NASA in September 1962. In August 1965, he served as pilot on the 8-day Gemini V flight. He and command pilot Gordon Cooper were launched into earth orbit on August 21, and proceeded to establish a space endurance record of l90 hours and 56 minutes. The flight, which lasted 120 revolutions and covered a total distance of 3,312,993 statute miles, was terminated on August 29, 1965. It was also on this flight that the United States took over the lead in manhours in space. On September 18, 1966, Conrad occupied the command pilot seat for the 3-day Gemini XI mission. He executed orbital maneuvers to rendezvous and dock in less than one orbit with a previously launched Agena and piloted Gemini XI through two periods of extravehicular activity performed by pilot Richard Gordon. Other highlights of the flight included the established new world space altitude record of 850 statute miles and the completion of the first fully automatic controlled re-entry. Conrad was spacecraft commander of Apollo 12, November 14- 24, 1969. With him on man’s second lunar landing mission were Richard Gordon, command module pilot, and Alan Bean, lunar module pilot. The Apollo 12 crew executed the first precision lunar landing, bringing their lunar module, “Intrepid,” to a safe touchdown in the moon’s Ocean of Storms. Along with Bean, Conrad spent 7 hours and 45 minutes on the lunar surface performing the first lunar traverse deploying the Apollo Lunar Surface Experiment Package (ALSEP), installing a nuclear power generator station which would provide the power source for long-term scientific experiments, gathering geologic samples of the lunar surface for return to Earth, and completing a close-up inspection of the Surveyor III spacecraft. As spacecraft commander on his fourth flight, Conrad flew the first manned Skylab mission which launched on May 25 and terminated on June 22, 1973. With him for the initial activation and 28-day flight qualification operation of Skylab Orbital Workshop were Joseph Kerwin, science-pilot, and Paul Weitz, pilot. Although subjected to a 10-day delay in their planned launch, Conrad, Kerwin and Weitz managed to complete 46 of 55 scheduled experiments and all of the nine programmed subsystem/operation detailed test objectives. Paramount to the completion of these objectives was deployment of a “parasol” thermal shade to alleviate the orbital workshop thermal problem created by loss of the micrometeoroid shield during the launch of the Skylab workshop. Also vital to the mission was a 3-hour and 23- minute extravehicular activity by Conrad and Kerwin to deploy the jammed solar wing. Their success in extending the only remaining solar array system wing assured sufficient power for the conduct of the full 28-day mission and would provide the needed energy to power the subsequent Skylab 2 and Skylab 3 manned missions. In logging 672 hours and 49 minutes each aboard the workshop, the crew established a new world record for a single mission, and Conrad captured the individual endurance record for time in space by bringing this total space flight time to 1,179 hours and 38 minutes. Conrad has also logged 14 hours and 19 minutes in extra-vehicular activities. In December 1973, after serving for 20 years (11 of which were as an astronaut in the space program), Conrad retired from the U. S. Navy to accept a position as Vice President, Operations and Chief Operating Officer of American Television and Communications Corporation (ATC) located in Denver, Colorado. Conrad was also a member of the Board of Directors of ATC. As Vice President, Operations, he was responsible for both the operation of existing systems and the development of new cable television systems throughout the country.